Help Yourself and Your Friends Cut Clutter With Candy! When you think of ways to clean up and clear out the clutter, candy probably isn’t the first thing that comes to mind. You’re likely imagining filing away papers, bagging up unwanted clothes for charity, and storing away seasonal decorations and linens in clearly marked boxes stacked to the ceiling in the garage. And…you’re right! Those are all components of cleaning up the clutter you already have. Candy comes in when it’s time to put a stop to new clutter before it happens. Unfortunately, we don’t have magical Whirly Lollipops that you can wave through the air to keep a junk drawer from overflowing. 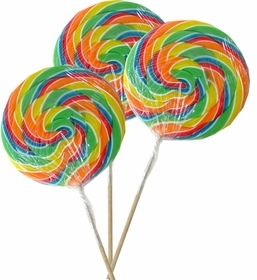 But Whirly Lollipops themselves never end up in the junk drawer, do they? In fact, amidst all the forgotten knickknacks gathering dust around your home, stuffed animals that have literally gone to the dogs, scented candles tucked away in a cabinet because they aren’t quite your thing, and bountiful bottles of perfumes and lotions that you’re not sure you’ll ever get to the bottom of, we’re going to guess there aren’t too many sweets laying around that you don’t know what to do with! That’s because Candy is naturally anti-clutter. We aren’t suggesting that you stop buying everything else and devote your full attention to candy. Although, to be fair, we have heard worse ideas! We’re just thinking that there’s probably something within your line of vision that you’d gladly trade for a bag of Gummy Strawberry Creams right about now. Perhaps it’s a gift from a friend that you never really liked but you didn’t want to hurt her feelings? A gift that makes you cringe every time you look at it, but you can’t bear to throw it away because it might break her heart? We all have more than our fair share of those. One of mine is a leopard print lamp shaped like a purse with a beaded handle and marabou trim. I’m not sure if I’m afraid all the trim will cause it to catch on fire, or that it won’t! Either way, I don’t use it, but stare at it trying to wish it away. Don’t do that to a friend. Don’t add clutter to their life. Don’t force them to bring a lamp into their home that brings anything but light into their life. Candy isn’t the only non-clutter gift out there, but it is one of the most universally-enjoyed and affordable. Just try to find a $12 necklace she’ll love as much as a $12 tub full of Candy Necklaces, or a gift that he’ll love now and later as much as he loves Now and Later! Can’t be done – candy is king! Candy is also colorful and fun, and makes a gift that’s as delicious as it is presentable. In other words, it’s pretty much the best gift ever. But for all the ways we broke into one of 2 groups as it applied to games, it was at the candy store that we saw our great consumer divide into the ‘Sours’ and the ‘Sweets’. I was one of the ‘Sweets’ through and through without fail until the day a certain crescent-shaped treat landed in a glass dish in that enormous case of candy. I still requested my bag be filled with its usual helping of Satellite Wafers and Sixlets, but I saved a few cents for that new candy that would forever seal my fate as one who lives on the border of ‘Sours’ and ‘Sweets’. And that candy was…Sour Patch Watermelons. To this day, I’m one of the ‘Sweets’. When a new sour candy hits the market, I’m usually one of the last to try it. I will always try it, though. 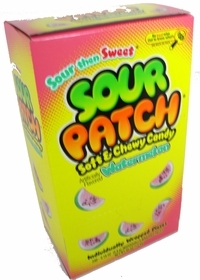 Sometimes I like it, sometimes I don’t, but it never becomes a candy staple like Sour Patch Watermelons. Even though it’s been 20-ish years since that first fabulous treat crossed my lips and worked its way past my taste buds and into my heart, I still hold onto the hope that it will happen again. I can’t help it – I’m a candy romantic! Sure, in recent years many new sweet treats have earned themselves heavy rotation in my candy cupboard. But the first and last of the sours was the watermelon. Perhaps it will always be that way, and if so, that’s OK! But I’ll keep tasting and trying so I don’t miss out on what might be the second most important sour discovery of my life. If you’ve read our recent blog post, “BlairCandy.com Is Your Store For Gluten Free Candy!”, you know we care about helping people on gluten free diets in still being able to enjoy their favorite sweets. After all, it’s your life, and you want to be able to eat the delicious foods you want. Of course, if you’re on a gluten free diet, you still want to be careful and maintain your health, with our Gluten Free Candy being a wonderful candy option for you. We recently had the great pleasure of coming across the friendly folks at OVitaminPro.com and their Gluten Sensitivity Support section. There is unfortunately no substitute for gluten, and it’s always best to follow doctor’s orders if you’re on a gluten free diet. However, many foods can contain hidden sources of gluten, and products like GlutenFlam can help aid in a more complete digestion of gluten. If you or someone close to you is on a gluten free diet, it’s important to learn as much as possible about gluten sensitivity problems. Not only does it show you care, but can do a world of good in helping educate you on gluten problems and conditions that can be related to gluten. OVitaminPro.com has a two-part CD series that includes a wealth of gluten-related information – Gluten Sensitivity Part I and Gluten Sensitivity Part II. Through our blog posts and gluten free candy section, we hope to educate all of our readers on how common gluten sensitivity is (as many as 1 in 3 people in North American have gluten-related issues!) and the different aspects of the condition. Here’s to OVitaminPro.com for helping us learn more about the science behind gluten free diets! BlairCandy.com Is Your Store For Gluten Free Candy! Are you following a gluten free diet? If so, you are not alone. The bookstore shelves are quickly filling with more gluten free cookbooks than any cook can keep up with as more people become aware of how the gluten in the food they eat may be causing medical issues. To help make candy shopping easier for you, we have created a special section for all the gluten free sweets and treats we offer. And don’t worry – these aren’t candies you’ve never heard of that were created specifically to be gluten free. They’re candies you already know and love that happen to also be gluten free. Pretty sweet, huh?! What foods is gluten found in? Common places you’ll find gluten include wheat, rye and barley – grains popularly found filling just about any box of cereal you might grab – as well as flour, pasta and beer, just to name a few popular foods and drinks. Because these ingredients are found in so many foods, people following a gluten free diet have to be mindful when food shopping or enjoying a meal or snack outside of the home. We created our Gluten Free Candy section to help make shopping for candy as easy and enjoyable as possible! Who follows a gluten free diet? While gluten is not a necessary element of our diets, most of us are not negatively affected by it in any way. And because gluten is found in so many of the foods we eat every day, those who make an intentional attempt to avoid gluten in their diet are predominantly those for whom it presents an issue. A gluten free diet is necessary for people living with the hereditary autoimmune disorder Celiac disease. While Celiac disease, which affects the small intestine, cannot be cured, it can be treated with a gluten free diet. Another autoimmune disease requiring a gluten free diet is the skin disease Dermatitis Herpetiformis, which also currently has no known cure. Eating a gluten free diet brings relief to approximately 80% of people living with this disease. A gluten free diet is also often recommended for those diagnosed with Autism or ADHD, though the effect the diet will have on the conditions is controversial. Many argue that there is no effect, while others have reported significant improvement. In the case of ADHD, there are also arguments that in ADHD-affected children for whom the gluten free diet was prescribed, the positive effect the diet brought on was the result of an improper diagnosis of ADHD initially, when the child was actually acting out because of the discomfort brought on by undiagnosed Celiac disease. At BlairCandy.com, we do not claim to be medical experts in any way, and we recommend that you consult your physician with any questions regarding a gluten free diet. We provide the above information simply as a reference, and hope it answers any general questions you may have about gluten free living. And now for the candy, which is our specialty! We have a mouth-watering selection of Gluten Free Candy in stock and ready to be enjoyed. From Gluten Free Candy Bars to Gluten Free Gummies, we have something for everyone.